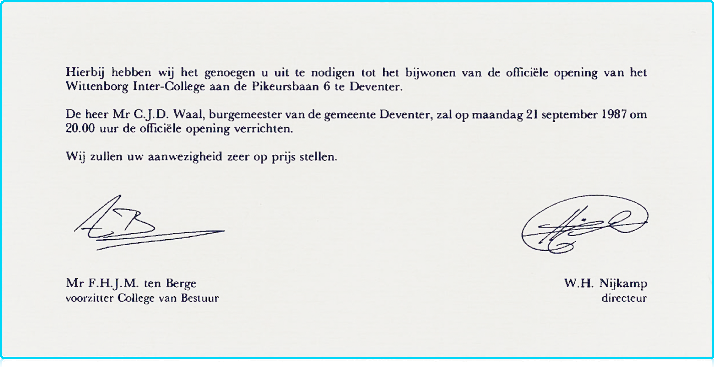 Wittenborg was opened by the Mayor of Deventer, C.J.D Waal on 21st September 1987 at it is then location on the Pikeursbaan in Deventer. It was first called Wittenborg InterCollege, however soon dropped the 'Inter' part of the name, keeping just Wittenborg College. From 1996, once it received its state appointment as a University of Applied Sciences it was officially called Hogeschool Wittenborg, and since its move from a Dutch speaking to an English speaking institute in 2007 the University has gradually been changing its title in all publications to Wittenborg University of Applied Sciences. Since 1987 Wittenborg has offered its programmes at 4 different locations, and each time its logo changed, until that of the present day. During the past 25 years, Wittenborg has offered programmes in many fields, including business, finance, real estate, banking, international management, languages, communication, ICT and Life Sciences. In the early years Wittenborg offered short courses and business to business programmes, in areas such as Marketing, ICT, and Communication. It also offred language courses in English. Wittenborg started to offer short degree courses in the 1990's and full Bachelor programmes since 1996, when it received its University of Applied Sciences status. Although Wittenborg has been offering full English taught degree programmes only since 2002, Wittenborg International was already offering courses in 1999 in cooperation with partners in Poland. The 25th Anniversary celebrations come after a time during which Wittenborg University has become an institute with a strong international profile while having significantly changed its appearance, location, and expanded its Bachelor and Master programmes through a long term partnership with the University of Brighton. It is intended that the festivities will reflect the current student body and the institute's partnerships, whilst looking back at the past acheivements and its students and forward to developing programmes and future growth. Info: The name Wittenborg was taken from the name of a German tradesman and Mayor of the Hansiatic City Lubeck, Johann Wittenborg (1321-1363). As a successful international businessman, trader and entrepreneur, Johann continued his father Hermann's international business, trading from the Baltics states to the Netherlands, Belgium and England. Wittenborg University of Applied Sciences will celebrate its 25th Anniversary with 3 days of events from 7th to 9th November 2012 in Apeldoorn. A Celebration Gala will be the final event during a week in which students, staff, and partners from business, education and the professional field will be invited to take part in a number of special events, seminars and workshops.